The new model year brings new upgrades for the 2016 Harley-Davidson® Heritage Softail® Classic, and it maintains its status as a leading touring cruiser crafted with Harley-Davidson® quality and tradition. The Heritage Softail® Classic, along with the rest of the Harley-Davidson® Softail® lineup, features a hidden rear suspension for a comfortable ride and a stylish rigid bike look. Learn more about the Heritage Softail® Classic here at Rawhide Harley-Davidson®, your Overland Park and Lenexa, KS area Harley-Davidson® dealership. 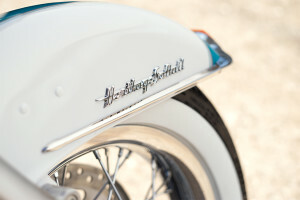 The Heritage Softail® Classic brings you authentic Harley-Davidson® styling. 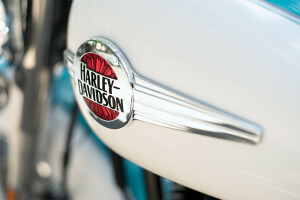 Old-School Tank and New 3-D Medallion: The glass-inlayed, cloisonné-and-chrome style medallion on the old-school fuel tank makes it easy to see why this bike is something special. 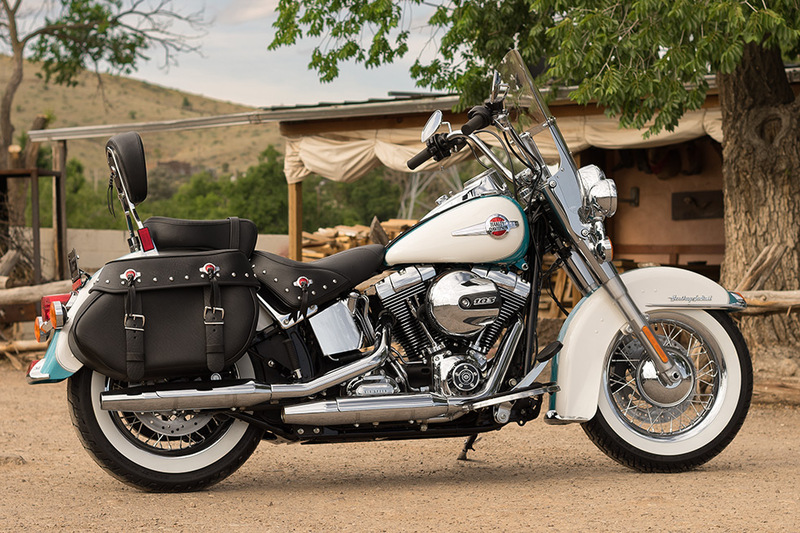 Nostalgic Custom Style: With brilliant white wall tires, laced wheels, and leather saddle bags and seat, the Heritage Softail® Classic is one classic ride. Hidden Rear Shocks: Like all Softail® models, this one gets the slammed, rigid look out back, but with hidden rear shocks to smooth out the ride. Tank-Mounted Console: The speedometer face boasts a big, bold display on top of the console, and it also includes an odometer, tach, and gear indicator. The Heritage Softail® Classic comes standard with a big, bold High Output Twin Cam 103B™ engine. 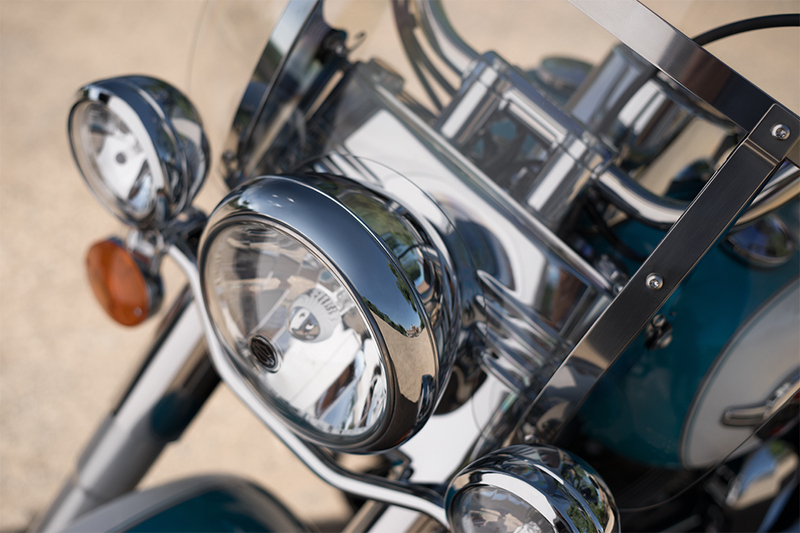 High Output Twin Cam 103B™ Engine Heritage: This engine is descended from legends like the Panhead, Shovelhead, Knucklehead, so you know it’s bred to deliver unbeatable reliability. 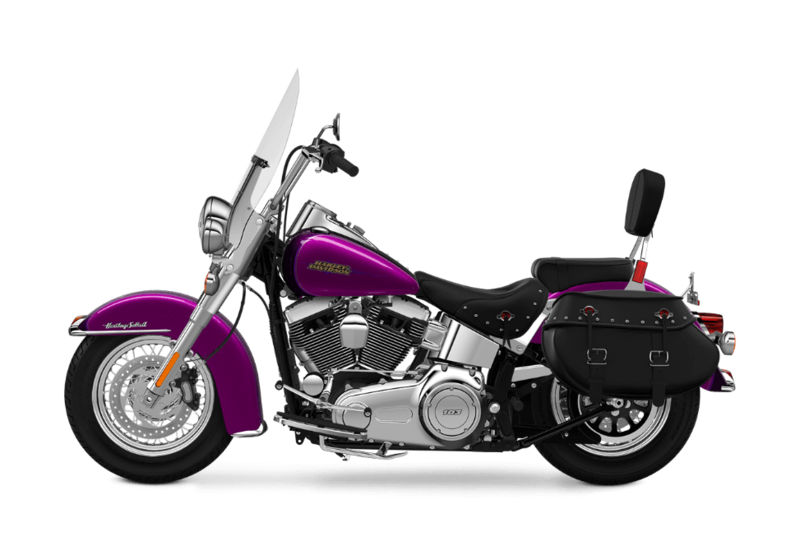 High Output Twin Cam 103B™ Engine Innovation: The latest Twin Cam 103B™ delivers impressive muscle and reliability through modern innovations like fuel injection and lightweight cylinders. 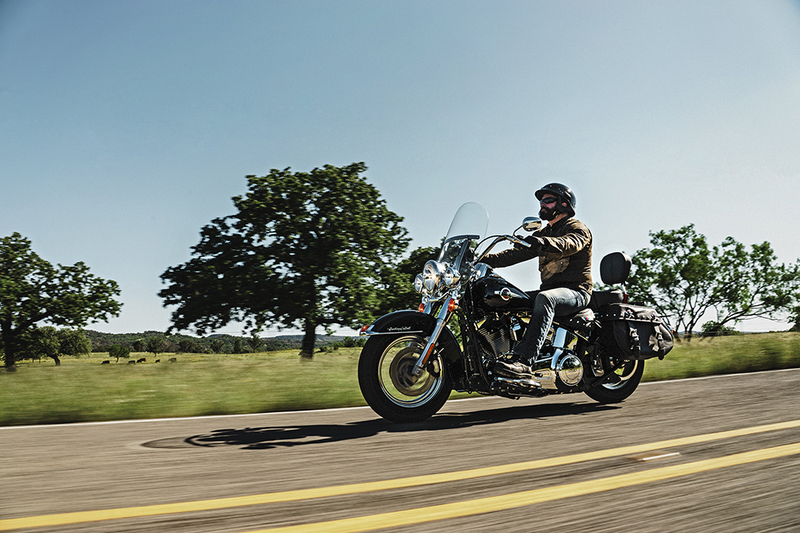 High Output Twin Cam 103B™ Engine Power: You’ll never want for power thanks to the generous torque and horsepower ratings produced by this big V-Twin. Six-Speed Cruise Drive® Transmission: This smooth shifting gear box is a pleasure to use, and it makes it easy to manage the power produced by the Twin Cam 103B™. 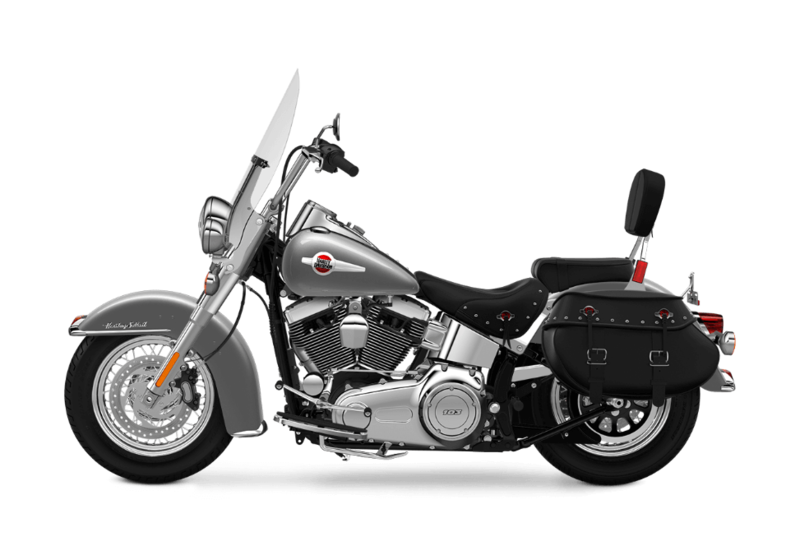 Pure Harley-Davidson® Styling: The chrome rocker covers, chrome air cleaner cover, machined cooling fin tips, and distinctive badging all add up to form one head turning engine. It’s easy to see that the Heritage Softail® Classic is a throwback to a different time, but that doesn’t mean it’s outdated. It gets the modern features that you need. 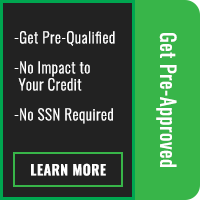 Standard Anti-Lock Brakes: With standard antilock brakes, you can rest easy knowing you’ll be able to slow down in a hurry when necessary. 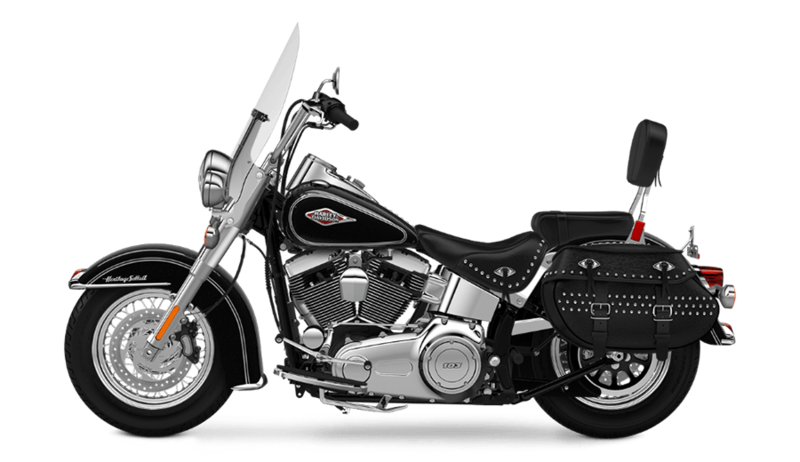 H-D® Smart Security System (Optional): This smart feature operates via a wireless keyfob that automatically activates the security system when you leave the bike and deactivates it when you return. 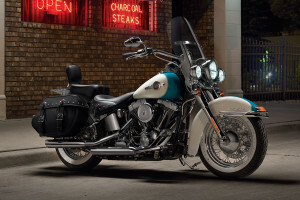 The Heritage Softail® Classic provides exceptional handling at both high and low speeds. 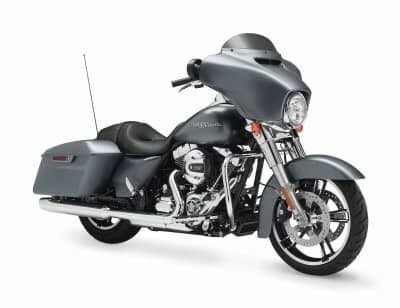 Front Brake System: You’ve got bigger brake rotors, bigger pistons, and more powerful calipers to deliver more braking force with less lever pull. 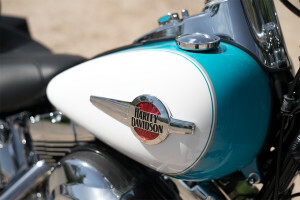 Dunlop® Tires: These white walled tires aren’t just for looks. Premium Dunlop® rubber delivers exceptional grip and handling in all conditions. 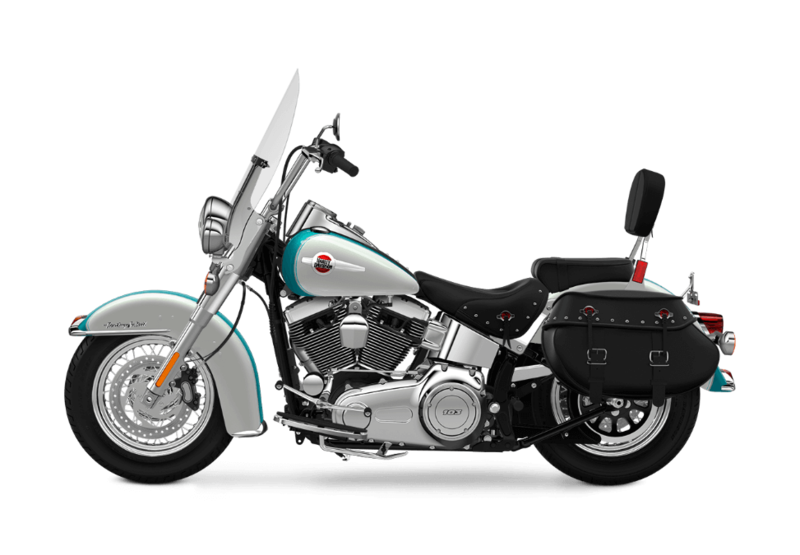 Electronic Throttle Control and Cruise Control: Electronic throttle control allows for smooth, simple interior wiring that preserves the clean look of the Heritage Softail® Classic, and you’ll appreciate the cruise control when you’re hitting the open road. Ergonomic Hand Controls: Your hands are in the perfect position for all day riding. All the buttons and switches you need are right there on the hand grips. 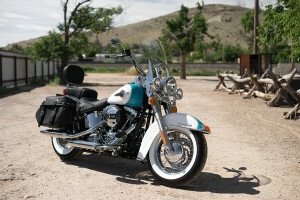 Comfort is important whether you’re riding around the block or around the country, and the Softail® Classic delivers. Convertible Two-Piece Seat: The Heritage Softail® Classic gives you a gorgeous leather two-up seat with a handy backrest for more passenger comfort. Full-Length Rider Footboards: Let your boots fall where you want them with these comfortable, rubber isolated footboards. Tall Handlebar: Tall riser bars put your fists in the air for an upright, commanding position. 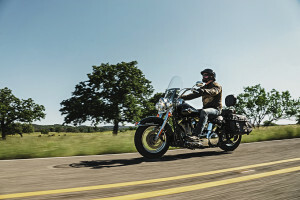 Detachable Windshield: The handy detachable windshield on the Heritage Softail® Classic can be put on or taken off with ease, which means you can quickly go from touring mode to Sunday afternoon cruising.